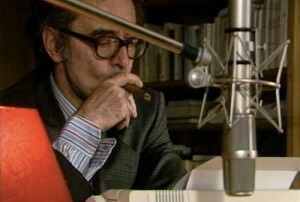 For more than half a century, Jean-Luc Godard (Film Socialisme) has been the subject of fierce debate among cinephiles. What has never been disputed, though, is his deep, abiding love for cinema. The masterful eight-part video essay Histoire(s) du Cinema, which he assembled over a decade (1988-98), demonstrates his devotion to the medium and the reverence he holds for those who transformed it into an art. Godard includes an extraordinary amount in the four-and-a half-hour running time, offering a sensory assault as he presents well thought out arguments about the importance of film. Godard has long been an extraordinary collagist, and Histoire(s) contains some of his most beautiful and touching juxtapositions. 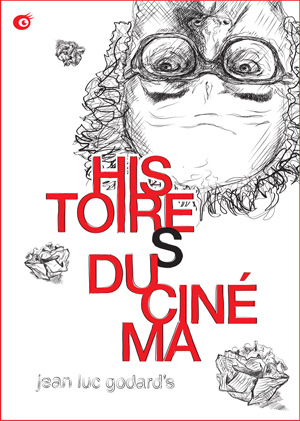 Jean-Luc Godard looks at the medium of movies in Histoire(s) du Cinema. The most emotional moments of course relate to the footage he uses — for which he initially obtained no copyright clearance, but which he has radically transformed in most cases via editing, speed and overlays. He adheres to no chronology and identifies few of the images and sounds. The pioneers are all present and accounted for (the Lumieres, Griffith, Chaplin, Eisenstein), in addition to the stylists (Lang, Welles, Renoir, Nicholas Ray, Rossellini) and his generation and those who followed (Pasolini, Rocha, Cassavetes, Fassbinder and his old friend Truffaut). 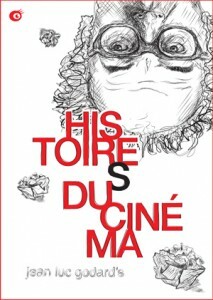 The second element is the one that distinguishes his “stories” from those in most movie-history documentaries (the title is a pun, as “histoire” means both “history” and “story” in French). He takes great care to blend cinema in with the other arts, by inserting quotes from literature, images of fine art, and music from classical and devotional melodies to Leonard Cohen (Bird on a Wire) and Otis Redding. The last aspect of the film that makes this essay personal in its approach (although nothing like Scorsese’s plot-heavy “personal” documantaries) is Godard’s presence on screen reading his own words and those of critics, poets and filmmakers. Also appearing on screen is the late Cahiers critic Serge Daney (whom Godard interviews, sort of) and a quartet of actors who read gorgeous bits of prose and poetry: Julie Delpy (Three Colors: White), Juliette Binoche (Chocolat), Alain Cuny (The Milky Way) and Sabine Azema (Wild Grass). Godard’s effortless blend of all of the arts does much to spotlight the singular techniques and uncommon beauty that is found in the work of his favorite filmmakers. It also helps to underscore when cinema reflected the horrors of the 20th century, most prominently the Holocaust (the one historical event that haunts Godard and leads him here to darker, heartfelt mediations). If one can set aside the inherent “brainteaser” aspect of the project (“where did that clip from?”), which can actually be answered by online sources that “decode” Histoire(s), one can focus more clearly on Godard’s thoughts on the strengths (and weaknesses) of cinema. There are playful notions — the famous JLG quote that “all you need to make a movie is a girl and a gun” — and the profound — that cinema offers a more accurate record of the past than the present. Whatever the mood that is created by his eye- and ear-filling superimpositions, one always has the sense of Godard’s supreme love for his chosen medium. The DVD box set, which includes two discs in slim cases, includes no supplements, but Olive Films is to be commended for making this very important work available legally in the U.S.